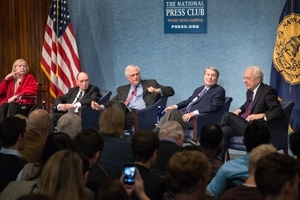 From left: Marianne Means, Sid Davis, Gilbert Klein, Jim Lehrer, and Bob Schieffer. The assassination of President John F. Kennedy left such an indelible imprint on the American psyche, the question of “where were you when Kennedy was shot?” has become its own cultural phenomenon. There was even a critically-acclaimed “Mad Men” episode about it. Gilbert Klein, assistant professor at American University’s School of Professional & Extended Studies, experienced the tragic event like millions of other schoolchildren. “I was in the eighth grade, in study hall, when the math teacher came in and announced it,” said Klein, co-director of the journalism program at the AU Washington Semester Program, in an interview. As the 50th anniversary of the assassination nears, Klein moderated a panel at the National Press Club with people who were much closer to the tragic events. Four seasoned journalists—Bob Schieffer, Jim Lehrer, Sid Davis, and Marianne Means—were all eyewitnesses to history in Dallas that day. And in front of a packed audience on November 4th, they had some remarkable stories to tell. Means, a longtime columnist for Hearst Newspapers, was the only woman reporter in the motorcade. And Means described an eerie feeling in the air. “It seemed that there was something different about this day. The convertible—everybody in it was very cranky,” she said. Davis, formerly of NBC News and Westinghouse Broadcasting, was also in the motorcade. “We were about right under the sixth floor window of the school book depository when the shots were fired. And there was no doubt in my mind that we heard three explosions,” he said. But it turned out that the call was worth taking. It was Lee Harvey Oswald’s mother. Schieffer brought her to the police station. “I interviewed her on the way. And it was a very strange interview,” Schieffer recalled. He tried to interview her assassin-son but was unsuccessful. “It was, to this day, one of the greatest adventures that I think any young reporter could ever have,” he said. At one point, Lehrer was at the police station while Oswald was being moved to another office. “I asked him, ‘did you kill the president?’ And he said ‘I didn’t kill anybody!’…And trust me, I wrote that down,” he remembered. Aboard Air Force One, Davis was one of only three reporters who witnessed Lyndon Johnson being sworn-in as president. Through his secretary, Johnson invited Jacqueline Kennedy to stand next to him while he took the oath of office. At that time, Davis said he could still see blood on her stockings, skirt, and hand. “I think that she knew that she had to be in that room for the swearing-in. And I found that to be very patriotic and courageous at the same time. That she would leave the casket and come into the room in that condition,” Davis explained. “What started as covering a routine presidential trip became the defining story of their careers,” Klein said at the event. And the panelists discussed the Kennedy assassination’s impact on both their careers and their lives. Towards the end of the evening, Klein asked why the JFK assassination remains such a powerful story. “I think it was John Kennedy,” Davis answered. Indeed, his vision and legacy are still celebrated 50 years after his death. Kennedy gave a seminal commencement speech at AU in June 1963. Titled “A Strategy of Peace,” Kennedy called for a nuclear test ban treaty, and he encouraged respect and understanding of the Soviet Union. Aspiring journalists from AU’s Washington Semester Program turned out for the National Press Club event. Two AU students from Germany, Sophia Lindsey and Lilly Maier, had Schieffer autograph copies of his book for them afterwards. “There’s a thrill, I think, of getting a story, and being there when it happens as it unfolds—even if it’s a terrible story like that,” Lindsey said.